Colour Business Cards, printed using our high quality litho printing service. These full colour matt laminated business cards are printed on the finest quality 400gsm card (size 85x55mm) and covered both sides in smooth matt laminate for extra durability. The business cards are supplied in PVC business card cases and presentation holder. Business card printing takes 3-4 days. How do I pay for (colour or delux) colour business cards ? Do I need artwork for (colour or delux) colour business cards? Printline Advertising is a printer in Leeds. 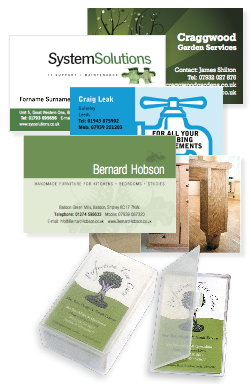 We have been printing colour business cards in Leeds since 1983.